This dusting tool from Rubbermaid extends up to 51" for higher ceilings. The straight edge is perfect for getting into hard to reach areas while the flexible top conforms to the shape of virtually any surface. Launderable for long product life. Features telescoping handle for simple and efficient overhead use. 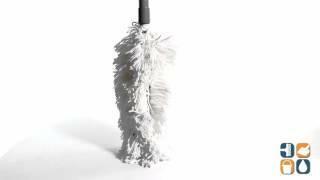 Bristle Color: White; Handle Material: Plastic; Handle Color: Gray; Handle Length: 51".